Holland bursts in to bloom a little earlier than the uk, in fact we receive a lot of our cut flowers for bouquets and the like from our Dutch neighbours. They celebrate the first of their tulips on National Tulip Day in just the last weekend of January, whereas in the uk there is ne’ry so much as a snowdrop to be found. You don’t need to be green fingered in order to enjoy flowers, after a long winter you may be surprised at the pleasure a simple bloom can give you, unburdening and full of promise. These flower displays are a fantastic way to get you out and about, if you’ve had your fill of museums or gastro-tourism these flower shows will get you out in the open air appreciating a bit of natural beauty. They’re a brilliant juxtaposition to the lively nights out that can be had in the urban centres of Holland, you could tack them on to a romantic trip or use them for inspiration to liven up your own garden back home. In the dying days of March, spring will truly have arrived as the famous Keukenhof gardens open their gates to the public. 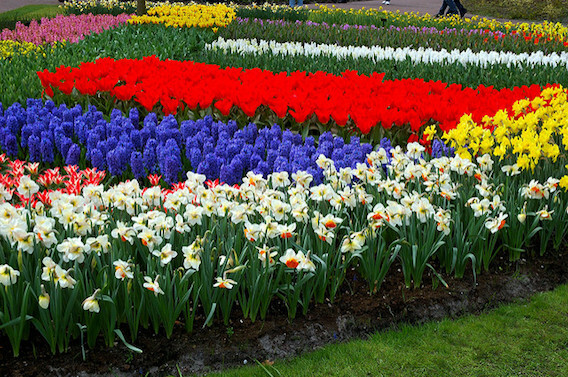 Keukenhof gardens are only open for a brief period, from March 23rd – May 21st. The Keukenhof gardens are boasted as ‘the most famous and largest flower park in the world’ what greater praise could we add? Situated just outside of Amsterdam between Holland’s capital and the Hague. You can easily plan a day trip to Keukenhof and be back at your accommodation in time for evening plans or an early one. It’s navigable from nearby cities like Leiden and Haarlem as well. The major draw of Keukenhof is that in spring the upwards of 7 million bulbs will come in bloom, making the luscious park practically a wonder of the world. If you don’t favour tulips then there are plenty of alternatives to marvel at orchids, carnations, roses, daffodils and much more. They make for an enchanting walk, carefully arranged for maximum impact. The theme for Keukenhof 2017 is ‘Dutch Design’ a tribute to the great innovators, engineers, artists and designers that Holland has produced and exported to the world. In Keukenhof’s Oranje Nassau Pavillion a reconstruction of the iconic Piet Mondriaan squares painting comprised entirely of a flower mosaic made up of tulips has been arranged as the centrepiece of this year’s theme. A beautiful animation of the abstract work. The Keukenhof gardens are open from 8AM to 7:30PM every day, but the ticket office closes at 6. During the first weekend of April an event called ‘Get in to the Green House’ will make hundreds of greenhouses both professional and amateur open to the public. Horticulture is big business in the Netherlands and this is a wonderful opportunity for you to learn from the masters, whether you’re after abundance or vibrancy you’re sure to pick up some tips. This event attracts over 200,000 visitors each year and is becoming a big enterprise that now involves some of the largest names in dutch horticulture. Activities, workshops and events are put on for children and there are talks and tours for adults about everything from growing to eating. Since the date of Get in to the Greenhouse crosses April Fool’s day we recommend you attend with a certain spirit of fun, since there will be plenty of kids about. In French speaking countries, April 1st is known as ‘April Fish and the given prank involves attempting to attach paper fishes to people’s backs. All done in good humour, but be on your guard nevertheless. 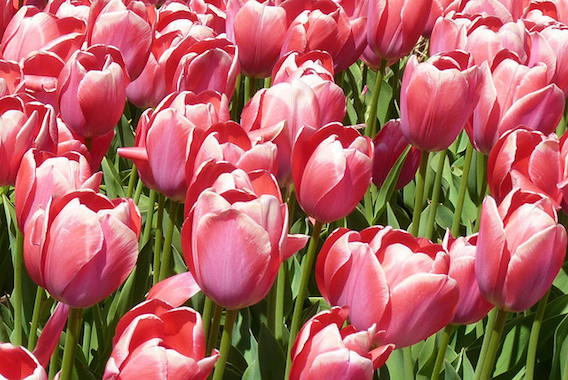 We all know Holland is closely associated with Tulips; and we’re sure you could name a few other common tropes. If you want your holiday to the Netherlands to be all about Tulips, bikes, windmills and wooden clogs then the Tulip Festival is where you need to be. April 14th – May 8th is the official opening time for the Tulip Festival, which is technically a 100km route throughout the country from Noordoostpolder in Flevoland, this is short way from Amsterdam but you’ll find yourself in unfettered countryside, so it is worth it, the sort of countryside that may make you consider purchasing watercolours. You do not have to travel the entire 100km to get a good feel for the Tulip Festival, there is 19km bike path called the garden route, which will let you see a lot more of the festival than you can on foot. There is also a picking station for you to take some tulips back with you and other goods sold by the people make a living on the flower trail. It would be remiss of us to ignore all the other major goings on in Holland this spring. The first week of April brings National Museum Week a real treat if you in intend to take a cultural tour of Holland as hundreds of museums will be opening for free and at discounted prices April 3rd-9th. 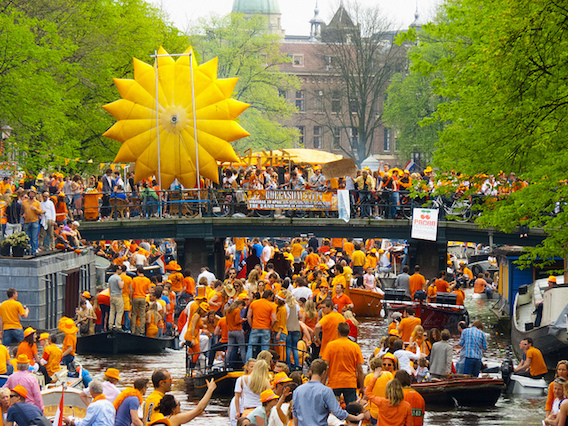 The King’s Day Parade April 27th sees Amsterdam explode in to a big orange street party that attracts crowds form all over Europe to revel amongst the canals of Holland’s Capital. Discover Holland at it’s most beautiful when the tulips are in full bloom! Travel with P&O Ferries in Spring 2017 from Hull to Rotterdam.